The automatic seat assignment takes account of any proximities you have set to create a harmonious seating plan (unless you have set it to random in the Preferences window). To get the best results it is usually advisable to use the automatic seat assignment and then fine-tune with drag and drop. Note If you drop a guest onto a seat that is already assigned to a guest, the seats of the two guests will be swapped. PerfectTablePlan Professional edition can assign multiple seatings in a single operation (e.g. when you have an event where you want guests to sit with different people every meal or course). •Hold down the button to show all guests that should be sitting next to each other. •Hold down the and buttons to show potential and critical seating issues, e.g. guests that should be sitting next to each other that aren't. You can also see non-optimally seated guests in the Troubleshooting report in the Report pane. Toggle the lock off in the same way. Note You can lock a guest who has no seat assigned. Generally you won't want guests who have cancelled or declined their invitations to be assigned a seat. You can control which RSVP status guests are allowed to be assigned to seats in the Preferences window. If you wish to assign guests to tables, rather than seats, you should still assign seats but not include seat numbers in your final table chart, guest chart or stationery. 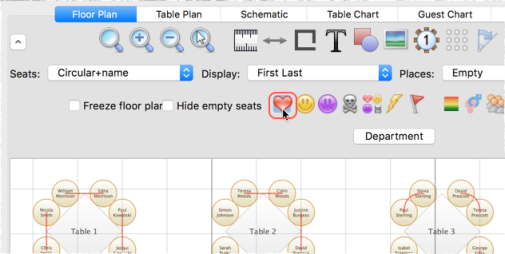 You can also drag a guest from their seat and drop them on the Floor Plan or Table Plan pane background to unassign them.